The problem is that, like my dad, most of us find it hard to wait for the fire to heat the grill well. Therefore, while waiting for the grill to heat up, most of us get involved in other projects and forget about the fire. There are different types of meat smokers in the online market nowadays. Check our reviews about Offset Smoker and Jerky Smoker. Going back to the grill, if you find that the charcoal burned out, you need to start all over again. Even after the grill heats up, it is not easy to regulate the fire. This causes your food to have a bitter or worse taste, being burnt. Now, I’m a dad myself and love grilling. I find the gas grill more efficient than the other models in the market. I compiled this buying guide to assist individuals struggling with their charcoal grills. The first-timers looking to buy a grill that is convenient and easy to use will also find this article helpful. Remember, although you may take great care while selecting and preparing food, the success of the food comes down to the quality of your gas grill. Today, the market is saturated with many models and features to consider. This makes it hard for most people to find the right grill for their needs. 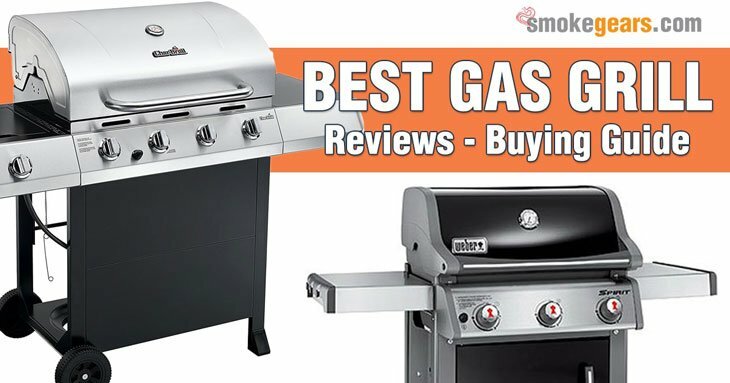 Our top 10 gas grill reviews buying guide brings you relevant information that will help you buy the appropriate gas grill. Details about electric smoker here will give you an idea how its works and how helpful is it. Buying Guide: What Should You Look for While Buying a Gas Grill? How to Use a Gas Grill? From the very beginning, the Weber brand has revolutionized backyard grilling. The brand produces products that give you a thrilling grilling experience. The Weber 46510001 model upholds this legacy from this brand. This best Weber grill offers you with everything you need to have a successful grilling session. Whether you are cooking an extension meal or a basic burger, this unit is engineered to bring you the performance you need. The cast aluminum construction makes it durable, lightweight efficient and simple to maintain. The Weber gas grills heat up fast, so you do not have to wait for long before you can start grilling. Besides, it distributes heat well for even cooking. Also, this model comes with high-quality cooking grates made of enameled cast iron. These grills hold heat well and create beautiful sear marks on your food. Additionally, the innovative flavorizer prevents flare-ups while preventing the burner tubes from clog-ups. Three high heat burners that deliver up to 32,000BTU per hour. Large cooking surface, 424 sq inches cooking area and 105 sq inches warming area. Simple ignition facilitated by electronic crossover ignition system. High-quality porcelain enameled iron grates. The 46110001 brings you excellent features that will make your backyard grilling enjoyable. This is a durable model made of high-grade stainless steel. The features that are available in this model will amaze you. Although it is a basic model, it has two stainless burners and practical features that make grilling easier. Another feature that makes this unit to stand out is the porcelain cast iron cooking grates. These grates combine superior heat retention and durability. The grates heat up faster and retain heat for long. This allows faster cooking of food, saving both energy and time. Similarly, this unit has excellent burners crafted from high-grade stainless steel. This allows them to stand out corrosion and rust that arise due to the small amount of water in liquid gas fuels. You will also love the simple controls that allow you to cook at an optimal temperature. 450 sq inches cooking surface. Flavorizer bars and porcelain enameled iron grates. The fuel gauge that notifies when the cylinder needs replacement. Owner guide that includes maintenance and cleaning tips. If you have a large family or like inviting guests to your barbeque party, this is an excellent choice. This is a four-burner gas grill that has advanced features for enhanced performance. Some of the features you will love about this unit include the front mounted controls knobs and porcelain coated grates. With a 660 sq inches cooking surface, you can grill several chickens, ribs, and steak, enough for your guests at the same time. You will also find the 180 sq inches warming rack very useful. This unit also boasts of four steel burners. These burners are not only durable but also provide you with a cooking power of up to 40,000 BTU. Additionally, igniting the grill is super easy. With a push of a button, you can start grilling. This removes the need for the use of matches. Besides, this unit has two huge wheels that make it easy to move from one place to the other. Four stainless-steel burners with the ability to produce heat of up to 40,000 BTU. Extra-large metal side shelves that provide you additional workspace. The button push electronic ignition system offers for fast ignition. This gas grill seems to have something for everybody. If you think that the four burners are too big for you, you can rely on this model. This compact model brings you a sizable cooking surface. It will fit the needs of small families or individuals hosting 4-5 guests. The construction material tells you more about the durability and performance you can expect from this unit. The stainless-steel body is not only durable but also easy to maintain. In addition to this, this grill has ported tube burners that allow for even heat distribution. That is not all; you are also provided with temperature control knobs. These knobs allow you to cook your food at optimal temperature. Even if you have never used a gas grill model, you can be sure of enjoying your first experience when using this unit. Two top ported tube burners made from stainless-steel. Piezo ignition system that provides a reliable spark with a simple push of a button. 280 sq inches of cooking surface. Side plastic shelves provide an extra work surface. The Char-Griller 3001 is a darling of many individuals who love BBQ. Having a stainless-steel grill will not only offer you an impressive performance. It also lasts long. This unit brings you unique features such as a warming rack as well as a side burner. Besides the durable steel construction, you will love the ample grilling surface. This surface lets you grill enough food for your family and guests. The cast iron gates facilitate heat fast and distribute heat well for even cooking. Another crucial feature that is often rare to find on other models in the steel thermometer. This thermometer will enable you to prepare delicious food and healthy food. Remember cooking food at the right temperature prevents under-cooking and burning of food. The burners provide 40,800 BTU cooking power. Generous primary grilling surface measuring about 438 sq inches. A handy warming rack measuring 192 sq inches as well as a side burner offering 12,000 cooking power. Durable steel construction for enhancing performance and durability. High-quality porcelain coated iron grates. This is a Compact, durable and portable model. We love the aesthetic look combined with top-notch features for superb performance. This is a perfect model to replace your old and tired looking charcoal grill. The Cuisinart CGG-180 is also environment-friendly. It comes with a steel burner that distributes heats well for efficient cooking. In addition, the 145 sq inches cooking surface is great for small families. It also boasts of porcelain enameled cast iron grates that do not corrode or rust over time. You will also take advantage of the large lid that helps keep your food moist and palatable. Another reason why we have included this unit in our gas grill reviews is the space-efficient design. If you live in a small apartment, it doesn’t mean that you can enjoy grilled chicken together with your family. This is a great choice for individuals who are looking for a compact model to place on their patio. A portable gas grill with space-efficient design. Powerful stainless-steel burner that provides 5,500 BTU cooking power. Unique design that lets you use it as a tabletop grill or freestanding. Stand sets up and packs away in a few minutes. The Cuisinart CGG-200 Tabletop Gas Grill allows you to grill your food beautifully and comfortably. It is a perfect choice for people living in small apartments. And this model should be an excellent choice for camping, tailgating, as well as picnics. This versatile gas grill will let you grill all types of foods like a professional chef. We love the solid grilling performance facilities by the powerful stainless burner. The combination of the iron grate and heat distributing panel allow even cooking. Another reason to consider this model is the versatile modular surface system. This grill surface includes a series of interchangeable grill surfaces. This enables you to grill various foods including pizza, vegetables, and other delicate foods. Modular grill surface system allows cooking of different types of food. High-quality stainless-steel burner that delivers 12,000 BTU cooking power. Easy start facilitated by twist-start ignition. Cast iron cooking grate retains heat for long. Temperature gauge allows precise temperature settings and folding side shelves for extra storage. Gives you the power of a large grill in a portable, compact grill. The Broil King Signet 320 Propane Gas Grill offers you with unparalleled cooking versatility. This model is popular amongst BBQ lovers because of the performance grilling technology. This technology allows you to cook almost anything on your grill in the style you desire. You can rotisserie cook poultry, bake elaborate desserts, and sear steaks to perfection. All the features are engineered to bring you unrivaled performance. The aluminum cook box combined with steel insert enables you to cook food faster. It also includes large diameter and ported burners for even heat distribution. Similarly, this unit has cast iron grids that keep heat well for exceptional searing power that locks in flavor and juices. Additionally, the stainless-steel cooking system ensures superior heat distribution. Besides, it protects the burner reducing the risk of burner clogging and flare-ups. Three stainless-steel burners deliver up to 40,000 BTU cooking power. Precise temperature control facilitated by linear flow burner valves. Stainless-steel Flav-R-Wave cooking system allows even heat distribution. Side shelves bring you an extra preparation space. You can now enjoy top-notch grilling experience without sacrificing your space. This grill combines efficiency, ease of use and durability. This is an efficient grill that assists you to prepare finger-licking food all the time. Also, the compact design makes it a perfect choice for smaller decks and patios. This unit brings you exceptional features that you will certainly love. This includes double wall steel firebox, stainless-steel burners, and exceptional cooking grates. These features work hand in hand to bring you with consistent heat for fast cooking. In addition, you will love the hassle-free ignition system. In fact, with a simple push of a button, this grill gas power takes charge. And you are moments away from enjoying a succulent burger and juicy steaks. Easy push-button electronic ignition that removes the need for using matches. Two cast iron cooking grates provide you with a 350 sq inches primary cooking area. Two steel enameled heat tents for even heat distribution. A double wall stainless-steel lid that locks in flavors and juices. The Original Fuego Element Gas Grill appeared in the market in 2011. Since its launch, it has undergone many improvements to boost its performance. The Fuego Element F21C gas grill is an advancement of the 2014 model. Compared to the predecessor, this model has a wider and more stable wheelbase. The unit also features a new control valve that allows better temperature control. You’ll be amazed to learn that this unit has the ability to reach 500F with only five minutes of initial heating. It also features a recessed thermometer for optimal temperature control. To make cleaning easier, this model has included a residue tray. This tray captures all the grease runoff from the diffuse panel. Besides, this unit boasts of dual ring burner coupled with a superb iron grate. These features are balanced to prevent any hot spots, ensuring perfect seat marks. Proudly American, design by Robert Brunner, the former Apple chief designer. Ability to reach a temperature of 500F with only 5 minutes preheating. Boasts of a unique porcelain enamel cast iron grate paired with high-end burners. This allows it to provide amazing sear marks. Compact design perfect for small balcony or patio. The 346 sq inches cooking surface is impressive especially while considering the small footprint. Hassle-free push-button electronic ignition and hinged storage access door. The first thing you need to know is the benefits of purchasing a gas grill. Yes, there’s no alternative to it. And this will make it easy for you to understand what factors you should consider and why. Well, some of the grilling purists say that charcoal grills are the best grills for meat. As mentioned, the main problem with these grills is that it is hard to regulate the temperature. With the gas grill, it is possible to adjust the flame so that you cook your meat to perfection. Our meat grinder review will help you to prepare your meat for grilling. These are the main advantages of selecting a gas grill over the other grills on the market. Convenience: A gas grill offers you more convenience. For instance, they are simple to light than the charcoal grills. Also, they heat faster, so you do not have to wait for the gas to heat up. Speed: A gas grill does not only heat up fast but also allows your meat to cook more evenly. This grill distributes heat well making sure that each part of the food cooks to your liking. Control: With a simple turn of a dial, you can control the temperature to suit your needs. This is difficult while using a charcoal grill. Additionally, in situations where fire occurs, the gas grills are safe and responsive. Cleanliness: This is another area where the gas grills stand out. Unlike the charcoal grill where you will have to empty a lot of ash to clean, the gas model is different. There are hardly any ashes, making them easy to clean. While choosing the best gas grill model, you need to determine the grill type that suits your needs best. There are two main types – the stand-alone gas grills and built-in models. Most customers go with the stand-alone gas grill, as it is easy to set up. If you do not have propane gas, you just need to install it close to a natural gas line. This unit is also very portable, so you can place it anywhere safe in the outdoors. Besides, the stand-alone models are more affordable and convenient than the built-in gas grills. A built-in model is a perfect choice if you have an outdoor kitchen. They also look more integrated into space than the stand-alone models. They also blend well with the outdoor space and are more versatile to use. Many different types of grills and smokers are available in the market. If you want to know about them, check some of our review articles – Offset smokers, Pellet smokers, Electric Smokers, etc. Another consideration to make while purchasing a gas grill is the type of fuel the grill requires. You can either decide to use the natural gas or propane. Natural Gas: If you already have a natural gas hookup, this is the best choice. However, if you do not have a natural gas hookup in your backyard, you need to hire an expert to install one for you. Since these models need a permanent gas line, it means they remain at the same point. But, unlike the propane gas, the natural gas is cheaper and burn more efficiently. Propane: Propane gas grills are great for people who wouldn’t want to bring a contractor to install a gas line. Also, these models are easy to move around. These models are easier to set up anywhere you want. However, you have to buy new tanks now and them to replace the empty one. This means that if you do not have a backup tank and the gas runs out in the middle of the grilling process, you run the risk of prepping your meat. Convection: Most of the gas grills use this type of heating technology. When you light the burner, the flame produces heat and smoke that rises to heat the food and the air around it. Although this works well most of the time, there have been complaints of the grill drying the food. Cooking also takes much time, so it is not an appropriate choice if you are looking for a model that cooks fast. However, unlike the infrared models, the conventional models are more practical and affordable. Infrared: A grill that utilizes the infrared heating technology heats your food directly. The grill itself heats up fast to achieve high temperatures. This allows your food to be cooked faster and evenly. Also, this unit locks in juices, so that you can get juicy and tastier food. Additionally, these grills tend to be more efficient on energy and easier to clean. The only downside of this model is that they are expensive. If you are working with a limited budget, this is not an ideal choice. Now, you are aware of the major differences between gas grills models available on the market. With the above information, you can now narrow down your choice to something that fits your necessities. But, this not all you need to arm yourself with while purchasing the best model. You also need to know the features to look at. Before purchasing a grill, it’s crucial to consider your priorities. To begin with, you need to look at the size of the grill. Here you should think of the cooking space you need and the dimensions. Some of the things you need to consider are the number of people in your family and the type of food you like grilling. It might be tempting to get the largest model available. But you also need to consider the storage space you have. Besides, the largest models are often expensive. For most of us, the cooking performance is always the top priority when it comes to picking a gas grill. But, you should also ensure your safety. While doing the comparison, you should pick models with robust and stable construction. This will help reduce the risk of tip related accidents or fires. You should also avoid picking models with sharp edges or corners that can cause injuries. BTU shows the amount of power that a gas grill produces. You will find these measurements in the product description. Generally, a model with a higher BTU produces more power. Purchasing a grill with higher BTU will allow you to cook more food faster and evenly. If you are planning to hold large parties, picking models with side wings is an added advantage. This grill feature allows you to heat pots or warm buns. Additionally, the extra heating surface is crucial for multitasking. They will help you prepare a variety of food at the same time. It goes without saying, only select the model made of high-quality construction materials. Although many construction materials are durable, the stainless-steel stands out. This material gives your grill more than the aesthetic value. It also offers you a service you can rely on for many years. This is crucial for the portable models. Although most of the portable models are not very heavy, lifting them is not easy either. For added convenience, you should go for models with wheels. This will allow you to move it fast and easily to your preferred location. Some models need you to use a lighter or match to ignite, once you have turned on the gas. This means that you need to have a lighter with you to ignite. The models with electric push-button lighter make the ignition process safer easier. Some of the other benefits that are only found in some grills are a full set of cooking and grill cleaning tools. This will save you a lot of money since you don't have to buy them separately. Some models will have better distribution than others regardless of the technology used. Selecting a model with better heat distribution allows your food to cook faster. The cost of the gas grill is yet another major consideration. The small and simple gas grill can cost you less than a hundred bucks. On the other hand, the larger models with a lot of bells and whistles can cost over four thousand bucks. Generally, the size and features of a grill determine the cost. Additionally, models with recent technology and those from reputable brands cost more. Remember that the upfront cost of the grill should not be the only consideration. You also need to think about the running costs. If you intend to use your grill frequently, then invest a little more upfront on a natural gas grill. This will save you a lot of money in the long run. To boost your convenience, buy models that have some of the following extra features. Rotisserie: Models with a rotisserie are excellent choices for people who love grilling chicken. This feature allows you to make chicken burgers that are more delicious and even steaks. Cooking Grates: The cooking grates quality influence how your food is cooked. Besides, high-quality grates will last long. Precision Thermometer: Although a precision thermometer may seem a luxury addition, it is crucial. The most important thing about cooking healthy food is cooking it at the right temperature. A gas grill with a precision thermometer provides you with accurate temperature readings. This allows you to cook your food in a more efficient manner. There are three other types of meat thermometers in the market – a smoker thermometer, a probe thermometer, and a digital meat thermometer. As mentioned earlier, gas grill uses two types of fuel. They use either propane gas or natural gas. Refillable natural gas tanks supply gas to a natural gas grill. For you to use it, you must connect a gas line to the outdoor gas grill. On the other hand, portable gas tanks supply propane to the propane gas grills. Both grills have a regulator that allows a predetermined amount of gas into the burner. The burner arms supply the gas to the base and all over the burning area. After releasing the gas, a quick spark lights the gas. The grill is also equipped with regulators that let the user maintain even flow of gas while cooking. Using your gas grill is easy. A manual that has detailed information on how to light and use the grill accompanies your grill. However, in our gas grill reviews, we would also want to mention a few basic tips for using the grill. Before switching to the gas, start by opening the lid. This will prevent the gas fumes from gathering in the cooking box. Open the valve on the natural gas line or propane tanks and allow the gas to travel through the gas line. Turn the burner on and set them to high. After the grill is well heated, you can now put the food on the grill. Use the temperature control to avoid burning the food. Once the food is evenly cooked, remove from grill and serve. With the above grill reviews guide, I am sure it easy for most of us to select an appropriate choice. But, how will you keep your grill in top condition? Well, let us look at some of the tips to help you maintain your gas grill. Luckily, keeping your gas grill in top condition is not that hard. Using the following tips will allow you to enjoy many years of safe and healthy cooking. Ensure that there are no gas leaks: Perform routine gas leak checks at least once a month. To do this, turn the gas on and apply soapy water on the gas line connections. If there is a leak, you will see bubbles. You can resolve this by tightening the attachment or replacing the line. Check the ignition system: Turn the gas off and test the ignition button. Ensure that the pressure regulator, as well as the ignition, is running well. If there is no spark, secure the pressure regulator tightly over the tank. If the problem persists, check the battery in the ignition switch. Clean the electrodes for any acid buildup. Keep the grill covered up: Cover the grill before storing it. Most gas grill brands make their own gas grill covers, you have to buy them separately though. These covers are great for protecting the gas grill from harsh weather conditions. The cover keeps it from fading, rusting and fetching more dirt. Regular cleaning: Besides general cleaning, cleaning the grill after every use keeps it in the best condition. After using the grill, you should remove the burnt food and excess gunk. This will reduce the grime build up. Cleaning the grill is not hard either. You only need to have a high-quality grill brush, soapy water in a bucket and a sponge. And don’t forget to take an empty bucket for the debris. Although you usually scrub the grates after use, always begin thorough scrubbing. This will help you to get rid of all the remnants of vegetables or meat. Here, you need to use extra strength and if needed. Use the metal scrapper feature that comes with your brush. This will help you remove all those stuck chunks of food. Take the grates out after brushing the top. Check the bottom and if it needs scrapping, repeat the exercise. You can now proceed to clean the burner’s protector. The protector’s main job is to protect the burner from grease and dirt that may clog it. If you use the gas grill regularly, you should expect it to be very dirty. Furthermore, their main role is to hold the dirt and prevent it from reaching the burner. The best thing about these protectors is that most of them are removable. This makes them easy to clean. Soak them in soapy water for around fifteen minutes before washing them using the sponge. Scrub them properly and remove any remnant. After getting all the filth from the protectors, they will look shiny and new. Allow them to dry under the sun. Now, it is time to clean the burners. If your grill has removable burners, take them out and clean them using the soapy water. Nevertheless, if the burners are hard to remove, wipe them. Most people disregard this step. However, you will be astonished at how much grime comes from the burner. Since it is not easy to reach the burners unless you remove the protector, grime tends to accumulate. Proper and regular cleaning will help prevent clogging of the burner. After cleaning the burners, proceed to clean the plates beneath. These plates are filthy. Use the brush to scrub all the mess. After cleaning the stuck gunk, use the sponge and soapy water to clean until you have a smooth surface. To make your work easy, remove the plates before cleaning. After removing these plates, only the bottom tray remains. In most gas grills, the bottom plate is also removable. Remove it and scrap any gunk on its surface. Next, use the sponge to clean any grease from the bottom plate. And allow it to dry. After all the parts are clean and dry, you can now reassemble your grill. Reassembling it is pretty simple. You just need to do the reverse and make sure that each part is well secured. Dispose of the slime. Your gas grill is now ready for the next use. The experts recommend cleaning the gas grill 1 to 2 times yearly. But, if you use the grill regularly, we recommend cleaning after every other month. While using the grill more often, vegetables fall through the gate and grease build up fast. Even if you consider yourself as a master griller, there are some mistakes that you can make. So, whether you are a beginner or someone who has used a gas grill for long, avoid the following mistakes. Not preheating the grill: Although it is tempting to start cooking right away, you should always wait for the grill to preheat. It prevents the food from sticking to the grill. Additionally, it also results in food with attractive grill marks. Grilling with a dirty grill: Although you may feel tired to clean the grill after a whole day of grilling, it is essential to ensure that it is clean. Cleaning the grill will prevent the food from sticking to the grates. It also maintains hygiene and avoids grilling over previous night’s remnants. Not using the dials to control the heat: When it comes to grilling, the hotter is not always the better. After the grill has heated, it is now time to regulate the temperature. Placing the food over the direct and hot flames burns the outer side of the food before it cooks on the inside. Lifting the lid many times while your food cooks: Keeping your lid closed allows your food to be cooked faster. Of course, you need to look at the food and turn it over to cook evenly. But, don’t open the lid many times. If you do this, the grill will lose heat, and this will make the cooking process lengthy. So, whether you are in the market to find a more efficient grill or it’s your first time to buy a grill, get a gas grill. With our detailed guide, I am sure that you have all the necessary information to assist you in purchasing the most appropriate choice. Besides, choosing the best gas grill is also good for the environment. You will also find that it makes the outdoor barbecue much easier and fun.